The death toll from a powerful earthquake and tsunami in Indonesia leapt to 832 on Sunday, as stunned people on the stricken island of Sulawesi struggled to find food and water and looting spread. Indonesia’s Metro TV on Sunday broadcast footage from a coastal community in Donggala, close to the epicentre of the quake, where some waterfront homes appeared crushed but a resident said most people fled to higher ground after the quake struck. “When it shook really hard, we all ran up into the hills,” a man identified as Iswan told Metro TV. There were also concerns over the whereabouts of hundreds of people who had been preparing for a beach festival when the 7.5-magnitude quake struck on Friday, sparking a tsunami that ripped apart the city’s coastline. 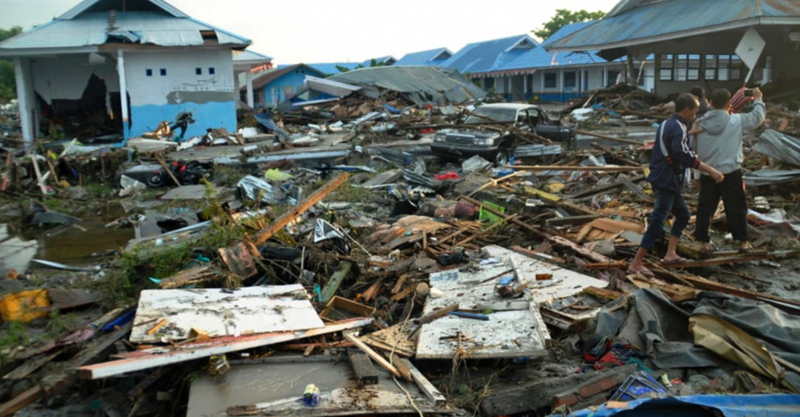 Indonesian president Joko Widodo visited the region on Sunday to see the devastation for himself. “We all panicked and ran out of the house” when the quake hit, said Anser Bachmid, a 39-year-old Palu resident. “People here need aid — food, drink, clean water.” Dramatic video footage captured from the top floor of a parking ramp as the tsunami rolled in showed waves bringing down several buildings and inundating a large mosque. Indonesia has been hit by a string of other deadly quakes including a devastating 9.1-magnitude earthquake that struck off the coast of Sumatra in December 2004. That Boxing Day quake triggered a tsunami that killed 220,000 throughout the region, including 168,000 in Indonesia.